In the very different presidential race of a year ago, Scott Walker was a front-runner in the race for the Republican nomination and Bernie Sanders was an asterisk in the race for the Democratic nomination. 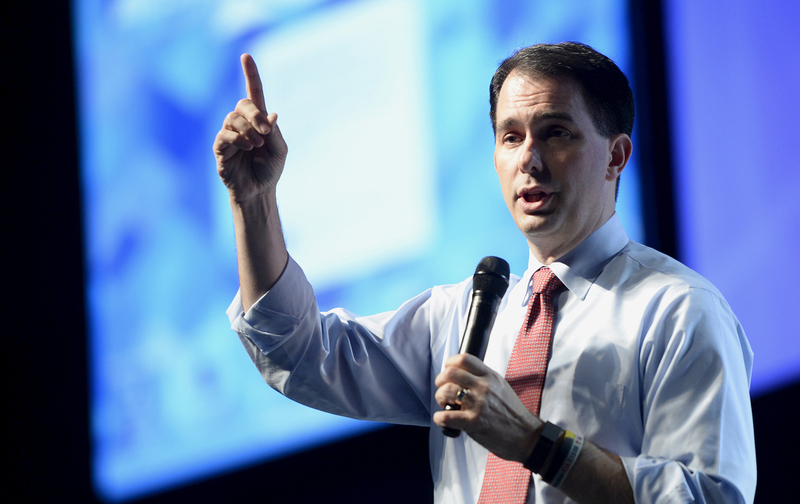 A year on, Walker is a 2016 footnote—out of the race nationally and struggling with low approval ratings in his home state. Sanders, on the other hand, is still in the race as an insurgent contender who has won 15 primaries and caucuses and secured more than 1,000 pledged delegates. The senator from Vermont is still running an uphill race—former secretary of state Hillary Clinton has won more states and more delegates—but polls suggest he could win a Wisconsin presidential primary on a day when Scott Walker won’t even be on the ballot. But, as Wisconsin’s April 5 primary approaches, Sanders is still running against Walker—and against the anti-labor, anti-public education, anti-public services austerity agenda of a Republican Party so toxic that it has become a host for the likes of Donald Trump and Ted Cruz. National media coverage from Wisconsin has focused a good deal of attention on Donald Trump’s spat with Walker. The 2016 Republican presidential front-runner is angry with the former 2016 Republican presidential front-runner for endorsing Trump rival Ted Cruz in advance of Tuesday’s GOP primary in the state. At the state Democratic Party’s annual “Founder’s Day” dinner on the Saturday before the primary, Clinton announced: “We believe that when a governor attacks teachers, nurses and firefighters, it doesn’t make him a leader. It makes him a bully.” And she drew cheers when she announced that, if she is nominated and if she becomes president, she will devote time and energy to helping state parties challenge Republican governors like Walker. In particular, Sanders has used his Wisconsin campaign stops to condemn assaults on voting rights by Walker and his legislative allies. And the senator attacks Walker for his ties to wealthy conservative donors as part of a broader battering of the current campaign finance system.